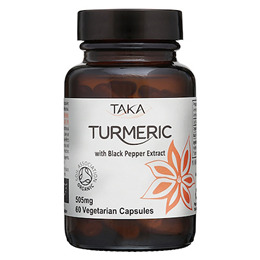 As well as being one of the essential ingredients in the TAKA Turmeric teas and drinks, their organic turmeric is also available in convenient capsule form. For many people, this is a quick, easy way to use this golden, sunshine spice as a daily dietary supplement. 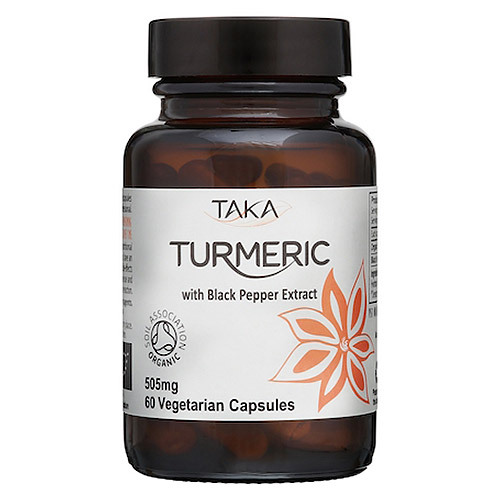 The turmeric is organically grown in Southern India, which makes TAKA Turmeric capsules ideal as a supplement in vegetarian, vegan, kosher and halal diets. Turmeric is an Ayurvedic spice that’s been part of Indian and Eastern culture for thousands of years. Turmeric’s rich, golden colour comes from a natural compound called curcumin. To make curcumin easier to digest, a tiny pinch of black pepper extract has been added to each turmeric capsule. Organic Turmeric Powder (99%), Capsule Shell: Hydroxy Propyl Methyl Cellulose*, Black Pepper Extract* (1%). Keep out of direct sunlight in a cool, dry place. Always consult your GP before taking nutritional supplements, especially if you are taking medication, have an existing medical condition or are pregnant or nursing. Below are reviews of TAKA Turmeric with Black Pepper Extract - 60 Capsules by bodykind customers. If you have tried this product we'd love to hear what you think so please leave a review. Excellent Turmeric extract, helped with a flare up of diverticular disease, however i will look for one that has 95 percent of curcumin in next time, as that is more potent.